This business about it taking 10,000 hours to achieve expertise is both troubling and heartening. Let’s say an outfielder has practiced catching 10,000 fly balls. Yet the most routine chance is still occasionally bungled. Does making 10,000 three-foot putts guarantee one will not be missed? Hardly. How many hours of training had the unfortunate inspector at the failed Fukashima plant who threw the wrong switch completed? Are there sure things in sports? I don’t believe so. And so we hear of a last second “meaningless” touchdown in a recent collegiate contest which, as it apparently did, cost Las Vegas millions. What are the odds? Reasonably good, I would assume, despite the rigorous application of expertise regarding the outcome, real and imagined. The online advice was useful – to a point. I was without an oven offering exceptionally high temperatures. There was no custom-made wood or coal oven, just a cheesy efficiency apartment model. Here are reviews of two examples, unofficially No. 10 and No. 229. Expensive mozzarella (burns too quickly), too liberally applied, huge to boot. Apparent signs of uneven heat from crappy oven, since replaced. 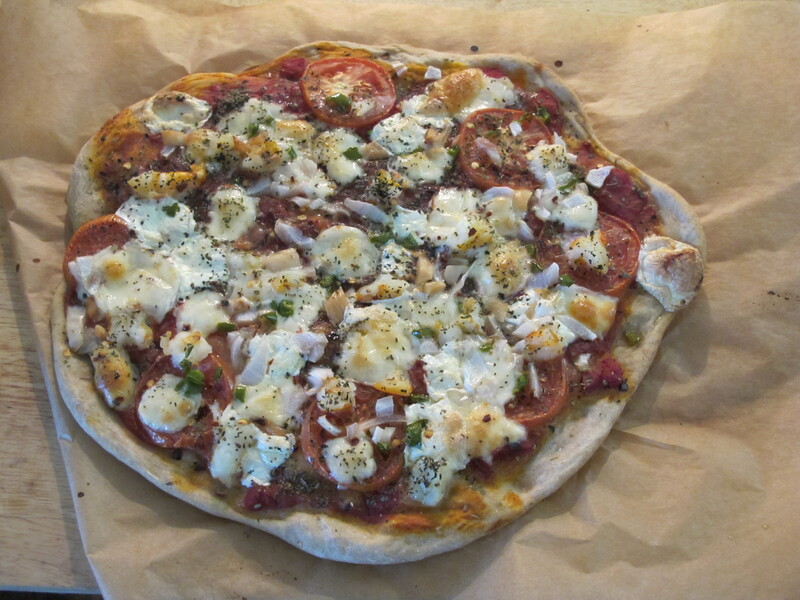 Tomatoes, garlic, likely canned tomato paste with hardly any water and olive oil, onions, dried oregano, basil, perhaps even onion and garlic powder, which may help explain the crust’s ghostly pallor. Conclusion: Work in progress. I must’ve been pleased enough to snap the photo. For private consumption only. Smaller, cheap, El Mexicano “Oaxaca Melting Cheese,” part skim. 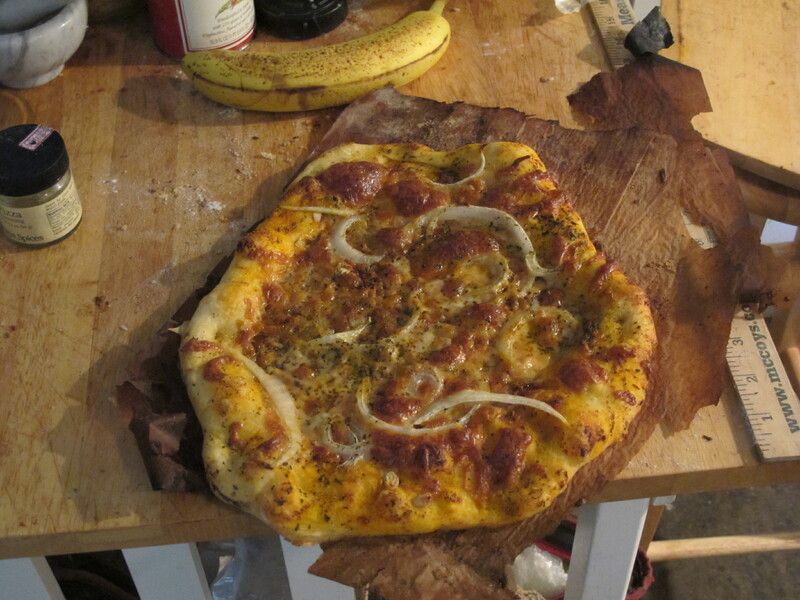 Crust had sat for several days in fridge, optimal. Nice and light, pliable. A little Amore Tomato Paste with water, garlic, olive oil, salt, pepper.